Soups of every description can be enjoyed year round, although the types of soup I make changes from season to season depending on what types of seasonal, locally grown vegetables are available. I tend to add as many vegetables as I can into my soups which I find enriches the flavor as well as the nutritional value in each bowl. This soup was born when I decided to use up a bag of dried beans in my pantry and had a big slice of pumpkin that we bought at our local market while in Italy. Normally I wouldn’t think to combine beans with squash, but the flavors in the came together nicely and the soup turned out great. The squash we bought at the market was quite similar in flavor and texture to butternut squash so I would recommend using a similar variety of squash. In my newly discovered adoration of dried legumes, I would heartily encourage you to prepare your own beans from the dried variety for the best results as well as make your own homemade broth. If however, you are really pressed for time and your alternative to making this soup would be to pull a frozen pizza from the freezer, then I would agree that both canned beans and broth would certainly be preferable to that option! This soup is delicious when served over a slice of crusty Italian bread that has been toasted and brushed with olive oil. Simply place the bread in the bottom of your bowl and spoon the soup on top. 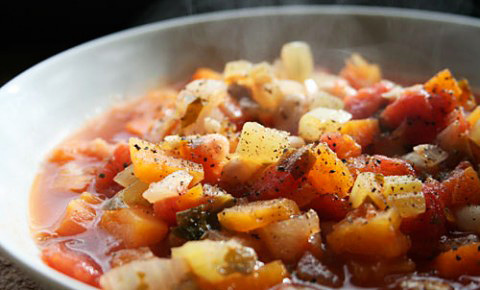 To finish the soup, drizzle the top with a little extra virgin olive oil. Winter squash like pumpkin, or butternut are rich in beta-carotene and vitamin C. This type of squash also provides significant amounts of potassium, vitamin B6, and lots of fiber making this a very heart healthy vegetable. 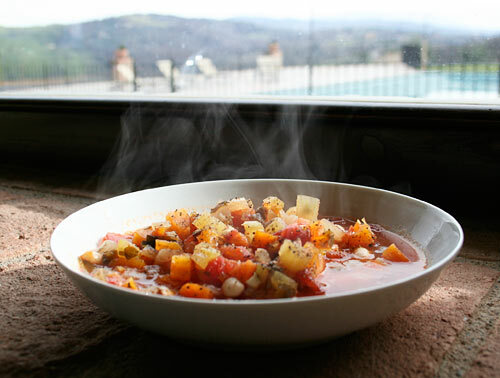 A tasty fall soup combining winter squash with white beans. In a large heavy stock pot heat the olive oil, and then add the onions, celery, and carrot and saute until soft and translucent. Add the garlic and cook an additional minute or two followed by the beans, diced squash, can of tomatoes, salt, pepper, and pepper flakes if using. Mix well, and add just enough broth to create a thick soup, keeping extra aside if needed. Bring the soup to a boil, then decrease the heat to a low simmer and cook until the squash and other vegetables are tender but not mushy, between 20 to 30 minutes. Add the parsley to the soup, mix well, and serve warm.